Motorola Mobility, the new independent mobile manufacturer that focuses on mobile phones has officially launched its most awaited Smartphone Motorola CLIQ2 and is soon coming to India. The powerful Smartphone CLIQ2 is the follower of famous CLIQ business smartphone. 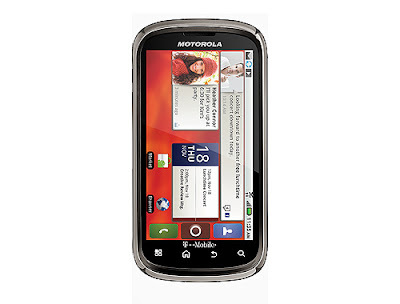 The Motorola CLIQ2 is a 4G device with MOTOBLUR enabled. It’s a Wi-Fi enabled Smartphone powered with ultra fast processor speed of 1Ghz. The phone will be exclusively introduced at T- Mobile, USA on 19th January. The Motorola CLIQ2 price will be soon disclosed. The Motorola CLIQ2 is a slider phone with stylish looks. The Smartphone weighs only 175 Gms with dimensions of 59.6 X 116 X 14.5 mm. The display screen of the phone is TFT type with display size of 3.7 inches. It’s a business ready Smartphone with productivity and updated security features. 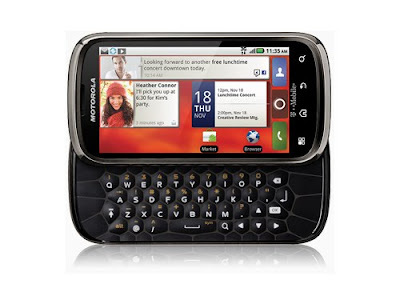 The Motorola CLIQ2 is an Android based gadget that runs on Android 2.2 Froyo. The Motorola CLIQ2 supports multiple networks i.e. WCDMA 850/1700/2100, GSM 850/900/1800/1900, HSDPA 10.1 Mbps, HSUPA 5.76 Mbps and EDGE Class 12 with internal antenna type. One of the best features of this Smartphone is its HD 5 mega pixels camera with Dual LED flash light. The camera supports digital zoom with auto focus technology that can capture high definition pictures and can be edited afterwards in the phone itself with image editing tools feature. The phone is powered with MOTOBLUR feature that makes the phone smarter. With MOTOBLUR the social networking is very easy. This mobile phone has the greatest ability to entertain through its amazing features. The phone has connected media player with almost all possible playable audio and video formats. The Smartphone has internet radio and FM radio receiver. Google talk, Yahoo messenger, AOL IM, and MSN are preinstalled in this phone. The phone has full HTML web browser with Android webkit including adobe flash player. The phone has intelligently designed QWERTY keypad for easier connection to family and friends. Accelerometer, Proximity sensor, ambient light sensor, Google maps navigation, Google maps street search, Google voice, Quick office, Blockbuster on demand, Amazon kindle are some exciting features supported by this smartphone. The Motorola CLIQ2 support up to 1GB available user memory and 2 GB microSD card pre-installed and can be expandable up to 32 GB microSD. The Smartphone support GPS and A-GPS technology too. The Motorola CLIQ2 is a powerful Smartphone with combination of Social connectivity and Android, which suits all the needs of users.